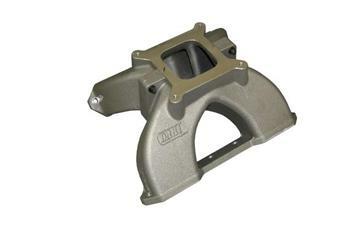 The Dart 9° manifold is a symmetrical, two-piece aluminum casting which greatly reduces the time required for the porting process. The casting was designed for porting and offers enhanced flexibility with the ability to adapt for standard or tall deck block applications, as well as compatibility with standard 4.400” or spread 4.500” bore spacing without requiring adapters or spacers. All 9° manifolds are designed to work with a 4150 carburetor flange. The two halves of the manifold are joined with hardened 12-point shoulder bolts, and are sealed with a 1/16” O-ring section. The single plane design features a large plenum area and optimized runner angles to transition the air fuel mixture smoothly from the carburetor to the cylinder head ports. As an integrated package with cylinder heads and intake manifold, Dart’s 9° small block design produces incredible power and torque for maximum effort racing engines.